Considerations for Purchasing the Right Guard Booth | BIG Enterprises Inc.
After deciding that your facility could benefit from a guard booth, it is time to determine which type of booth would best serve your needs. From style to size to optional features, you will discover that you have many important decisions to make. With so many options available, ordering a new booth can feel somewhat overwhelming. To make the process easier while ensuring you choose the exact security booth you need, helpful information is provided below. The first factor to consider when choosing the right guard booth is size. Whether your needs require a booth large enough to accommodate multiple guards plus surveillance equipment or you only need enough space for a single guard, B.I.G. Enterprises booths can be pre-manufactured in a wide range of sizes. In considering which size of security booth best meets your facility needs, think about the location where the booth will be positioned, as well as any relevant constraints. In addition, the intended use of the booth should be considered. In some cases, ordering multiple booths may prove to be the best solution to meet size requirements. If you are unsure as to the appropriate booth size, the best option is to send us a message with the content requirements. That way, the appropriate size of security booth for your facility can be ascertained. You should also give some thought to architectural style. Because guard booths are available in many different styles, you can choose something that will complement your existing facility. You can also select from optional features, including roof style, molding, and a host of colors. With so many available choices, selecting a booth that will blend seamlessly with the surrounding environment is easy. Once the basics of your booth are determined, the next step is to plan which additional features you might want incorporated in the design. To start with, you want to consider how the booth will be used. For instance, if employees will spend long periods in the booth, you may want to include a restroom or HVAC system to maintain optimal convenience and comfort. To enhance storage capabilities, shelving can be added to your guard booth. If there is a greater degree of risk at your facility, the security booth can be designed with tinted windows or even a bullet-resistant exterior. To improve the overall safety in the immediate surroundings, you also have the option of having floodlights installed. At B.I.G. Enterprises, we are available to assist with any questions that you might have. Our prefabricated booths are available in many sizes and with a host of additional features. 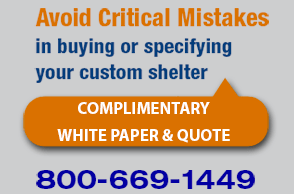 We have the experience necessary to supply and install whatever type of guard booth you want. If you need customization of an additional feature, please let us know so that we can create a one-of-a-kind design based on your needs.